Collaborative research: Diversity of the moss Physcomitrium pyriforme: significance of autopolyploidy within a phylogenomic and experimental framework. Collaborators: Matthew Johnson (Texas Tech. University) and Rafael Medina (Augustana College, IL). Overview: Whole genome duplication or autopolyploidy occurred repeatedly during the evolution of land plants and likely act as a major driver of evolutionary change. Such duplications first occurred within species, likely reproductively isolating autopolyploids. They may also trigger significant genomic restructuring, preventing meiotic pairing and hence interbreeding between two independent autodiploids. Genome duplications are thus effective mechanisms of microevolutionary change. They characterize many macroevolutionary lineages, and are expected to be frequent enough within species, for some to give rise to new evolutionary lineages. This project seeks to test whether shifts in ploidy are phylogenetically structured within a complex of cryptic moss species, the Physcomitrium pyriforme complex. It harbors seven karyotypes worldwide and exhibits much morphological variation, as reflected by its 29 synonyms. These annual, bisexual and selfing mosses are easily grown, and genome doubling is readily induced in vitro from sporophytic tissue, enabling tests of reproductive isolation among wild and artificial autopolyploids. This project addresses four objectives toward assessing the evolutionary significance of autopolyploidy: (1) reconstruct the phylogeny of the complex based on sub genome data,(2) infer frequencies of ploidal shifts within the complex; (3) identify morphological signatures of artificial genome duplication and through comparison with wild populations test whether these erode through time; and (4) test if wild and artificial polyploids are reproductively isolated. 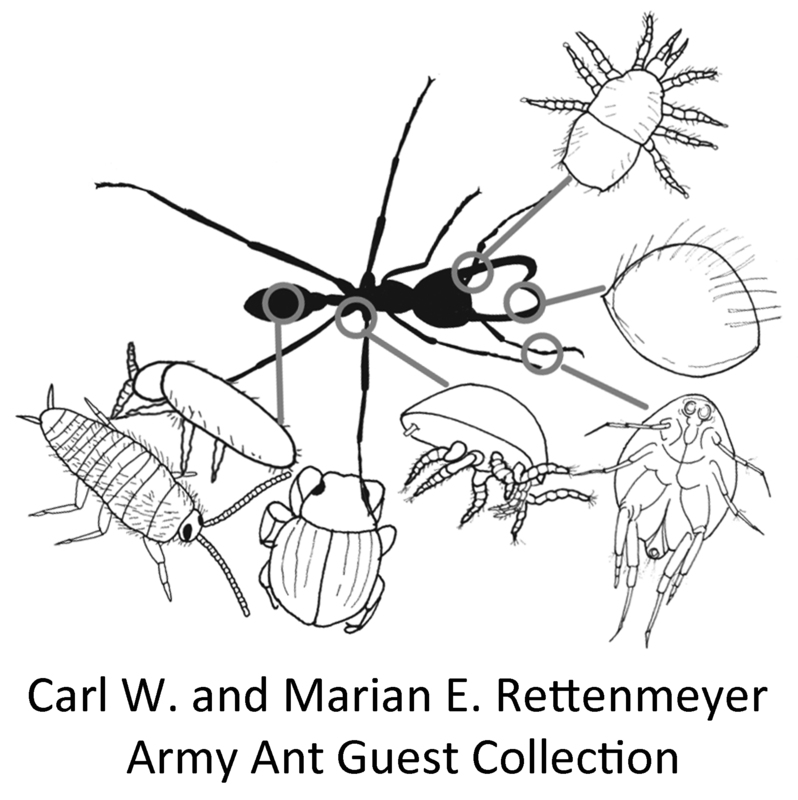 DBI-1561640 — CSBR: Ownership Transfer: Securing the future and accessibility of the Carl W. and Marian E. Rettenmeyer army ant guest collection. PI: J.N. Caira; Co-PI: J. O’Donnell & B. Goffinet. Overview: The motivation for this project comes from the recent donation of the Carl W. and Marian E. Rettenmeyer Army Ant Guest Collection (AAGC) to UConn and its transfer to the Department of Ecology & Evolutionary Biology’s state-of-the-art Biodiversity Research Collection Facility (BRCF). This amazing collection is the result of over 50 years of fieldwork by the Rettenmeyers in Central and South America. The AAGC comprises ∼2 million specimens of New World army ants, representing 114 species, and 1,200 colonies, as well as ∼100,000 specimens of a spectacular diversity of their myrmecophile guests. The guests include hundreds of species of mites, beetles, flies, wasps, springtails, and bristletails. The AAGC also contains ∼1,000 type specimens of 200 species. There are ∼16,000 pinned specimens and ∼5,000 microscope slides, but the majority of specimens are preserved in ∼15,000 vials and 200 jars. The collection is complemented by extensive and detailed field data and 5,000 Kodachrome slides. The urgency of this request stems from the collection being currently unusable and in urgent need of stabilization—fluid levels are low, stoppers are deteriorating, containers are non archival, specimens are overcrowded, some slides need sealing, and specimens are not organized for easy retrieval. The opportunity to benefit from Marian Rettenmeyer’s knowledge is vanishing. With the assistance of an experienced team of UConn programmers, the AAGC would, through this project, realize its full potential as a valuable on-line resource for the study of complex host/symbiont systems. Perhaps most importantly, this project will ensure a secure future for the AAGC. 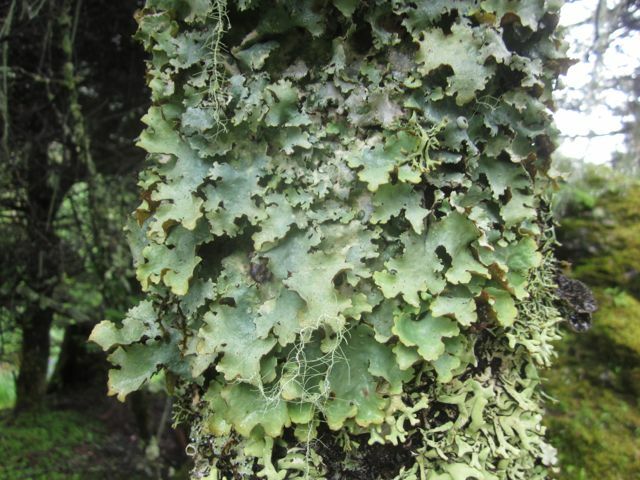 DEB-1354631: Collaborative Research: Starting from scratch with Sticta: Evolution, diversification, and conservation of a megadiverse flagship lichen genus. This project will generate a global phylogeny of the megadiverse lichen genus Sticta, challenging current knowledge regarding the evolution and species delimitation in this taxon. Sticta is an important component of forest and grassland ecosystems in temperate and tropical regions, contributing to nutrient and water cycles, and is a sensitive indicator of human-induced disturbance and global climate change. The project will focus on the diversification of the genus within a framework of palaeobiogeographical and palaeoecological data and elucidate the evolution of phenotypes and photosymbiodemes and their importance for the understanding of thallus morphogenesis and mycobiont-photobiont interactions in lichens. In order to achieve our ambitious goals, we have assembled a substantial amount of preliminary data and will employ advanced and novel methods, integrating molecular, morphological, and ecogeographical data, and the combined knowledge and skill base of an internationally respected team. This will be the first study to elucidate the evolutionary history of a large lichen genus. The results will challenge current knowledge in what has been considered a relatively well-known macrolichen taxon. It will also be the first approach to test ITS barcoding for a large fungal genus, and we collaborate closely with the recently launched interdisciplinary project of The Field Museum and the Committee on Evolutionary Biology at the University of Chicago on “Species Inflation or Discovery of Hidden Diversity? using molecular data to delimit species”. The project will implement novel approaches and strategies that effectively integrate molecular and phenotype data, such as morphology-based phylogenetic binning to place type specimens in the context of a molecular phylogeny or to provide the base for a phylogenetic identification key. We consider this a transformative model study to approach a wide range of aspects of the natural history of a diverse group of lichenized fungi. This project does not only provide a revised, solid species-level classification of the genus Sticta for the purpose of advanced ecological and applied studies, but with three postdocs, we also provide the next generation of broadly trained, versatile lichen taxonomists. Results from this work will have implications for many areas beyond biodiversity and systematics. 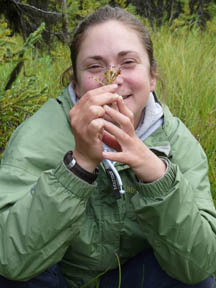 DEB-1311405: Doctoral Dissertation Improvement Grant (thesis by Lily Lewis): Resolving bipolar phylogeographic histories in dispersal limited mosses: a RAD-Seq approach. Project overview & objectives: Bipolar disjunctions are recurrent across land plant lineages, and have been predominantly explained by long distance dispersal (LDD) across the tropics. The vector most widely recognized for LDD is wind, however, Polar Regions lack wind connectivity. The occurrence of disjunctions that lie outside the current paradigms of LDD suggest that the dispersal pathways and processes shaping our global floras are much more diverse than acknowledged by blanket hypotheses. LDD of dispersal limited organisms, or across dispersal limiting disjunctions, such as the bipolar pattern, is arguably the scenario that most commonly leads to allopatric speciation and endemism, due to the presumed rareness of dispersal events, and thus plays an important role in broad evolutionary questions on the origin of species. In order to elucidate the broad and fine scale processes responsible for the origin of the bipolar distribution, and the origin and fate of a dispersal limited Southern South American endemic species, Lewis is using a combined phylogenetic and phylogeographic approach, incorporating innovative genomic techniques, in a non-model dispersal limited system. Methods: Molecular data were analyzed under a phylogenetic framework to distinguish between broad scale hypotheses of the origin of the bipolar disjunction in the dispersal limited dung moss Tetraplodon. Lewis has shown that extreme long distance dispersal across the American tropics most likely explains the origin of the bipolar disjunction in Tetraplodon. Short tandem repeat (STR; microsatellite) loci, were developed from a next generation sequence (NGS) dataset in order to infer fine scale patterns and processes associated with bipolar LDD. In order to efficiently and cost effectively expand the phylogeographic data set, Lewis will employ a restriction site associated DNA sequencing (RAD-seq) approach to identify, sequence, and subsequently genotype 9000 homologous loci across 125 populations representing the bipolar disjunction in Tetraplodon. 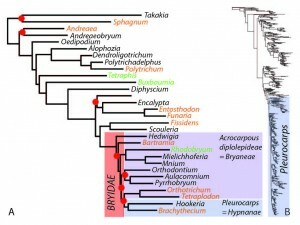 DEB-1311405: Reduction & reversal in the Funariaceae: phylogenetic perspective on sporophyte complexity and role of the calyptra. Project overview and objectives: Macroevolutionary trends are widely associated with increases in morphological, anatomical or physiological complexity. Complex characters have also been lost multiple times across the tree of life, consequently erasing the evolutionary signature shared by descendants from a unique common ancestor. The result is that phenetically similar taxa are often artificially grouped together. Such has been the case in mosses, where reduction is hypothesized in many lineages and is particularly prevalent in the Funariaceae. Much of our knowledge of fundamental aspects of moss biology is based on studies of members of this family, a significance that continues today with the recent emergence of Physcomitrella patens as a model organism in plant biology. Nevertheless, P. patens is currently a classic example of a morphologically reduced taxon of uncertain phylogenetic placement. Character reduction in the Funariaceae takes several forms, ranging, for example, from virtual loss of the stalk (seta) that elevates the sporangium to reduction in complexity of the spore dispersing structure, the peristome. The structure of the peristome and mode of dehiscence of the sporangium have long been treated as essential systematic characters — the peristome is analogous to the flower in moss classification — yet at the same time frequent reversals render classifications based solely on morphological traits tenuous. To assess polarity of character transformations and the significance of character-states in the family’s evolutionary history, we propose to construct a phylogenetic hypothesis for the Funariaceae based on 15 loci and a minimum of 60 ingroup taxa. Taxon sampling will approach 90% of the generic diversity and represent a broad spectrum of sporophyte reduction. We will score at least 60 morphological characters and reconstruct ancestral character-states to identify synapomorphies and test whether the loss of complex traits is reversible in the Funariaceae. 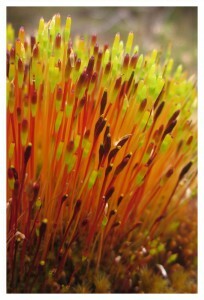 The sporophyte of all bryophytes remains attached to the maternal plant throughout its short life. Maternal care for the developing sporophyte is a unifying feature of all land plants. Mosses are further characterized by a unique maternal plant-sporophyte interaction, one that involves retention of a hat (i.e. the calyptra) of maternal tissue covering the apex of the developing sporophyte. The calyptra is essential for normal sporophyte ontogeny: precocious removal of the calyptra results in sporophyte abortion. The precise mechanism of this interaction is unknown. In this proposal we describe a novel observation: the outer epidermal cells of the calyptra have a relatively well-developed cuticle in Funaria hygrometrica . We suggest that one role of the calyptra is to provide an essential barrier to water loss from the meristematic regions of the sporophyte that lack a proper cuticle. This suggestion in turn leads to the hypothesis that the evolution of sporophyte complexity is linked to the presence of the calyptral cuticle. We will survey the phylogenetic pattern of cuticle deposition on calyptrae using transmission electron microscopy and test for correlations between calyptra cuticular traits and sporophyte complexity to provide phylogenetic evidence for a potential role of the calyptra in preventing dehydration of the sporophyte. DEB-1240045: Collaborative Research: AToL: Assembling the Pleurocarp Tree of Life: Resolving the rapid radiation using genomics and transcriptomics. Co-PI: Dr. A.J. Shaw (Duke) & Dr. N. Wickett (Chicago Botanical Garden). Research collaborators: Dr. Yang Liu (UCONN), Dr. Nicolas Devos (Duke) and Dr. Matt Johnsson (Chicago). This project fills a significant knowledge gap about the green plant (Embryophyte) tree of life. Mosses (phylum Bryophyta) compose a speciose early lineage of land plants that diversified in the Paleozoic long before the angiosperms arose, at a time when plant gametophytes were the dominant and perennial life history stage. The crown group of mosses, the so-called pleurocarps (subclass Hypnanae), comprises nearly half of all moss species, and dominates various terrestrial ecosystems throughout the world. Previous research indicates that the pleurocarps represent a rapid Mesozoic radiation and, not surprisingly, attempts to reconstruct their phylogenetic relationships based on limited genomic sampling (i.e., < 10 loci), even with extensive taxon sampling, have been largely unsuccessful. Divergence at individual loci is weak, and alternative systematic hypotheses remain tentative at best. Slightly over 5,000 species distributed among 500 genera compose the Hypnanae. Transitions between terricolous, epiphytic and even aquatic habitats occurred repeatedly and in all directions, often erasing the morphological signatures of evolutionary history. Consequently, the circumscription of and the relationships among genera as proposed based on morphological traits are widely contradicted by phylogenetic inferences from DNA data. This project utilizes the latest innovations in genome technology to reconstruct relationships among the mosses, with an emphasis on the recalcitrant pleurocarps. Specifically, the project includes three major activities. (1) A gene enrichment strategy will be used to target approximately 100 plastid and mitochondrial exons, and 1000 nuclear loci to reconstruct the Moss Tree of Life with a focus on the phylogenetic relationships within the Hypnanae, for which 400 examplars spanning the phylogenetic spectrum will be targeted. Baits for organellar gene capture will be developed based on recently acquired genomes and baits for nuclear gene enrichment will be developed from transcriptome data derived from four phylogenetically divergent taxa. (2) Transcriptome data will be generated from 36 additional exemplars to investigate gene family evolution and detect any signature of past whole genome duplication(s) that might have been associated with the rapid radiation of pleurocarps. (3) Conduct an aggressive outreach program targeting school kids, undergraduates, and developing bryologists. Post-doctoral training will benefit from tight collaboration among the three participating labs such that each trainee gains expertise in all aspects of the research, laboratory and analytical. The outreach program includes workshops especially tailored to bryophyte systematists who need to learn how to deal with the vast amounts of data available in today’s genomic era. Workshops will be complemented by student-produced webinar presentations. DEB-1146295: Rapid radiation and sporophyte evolution in the Funariaceae: inferences from phylogenomics and cross generational cuticle development studies. Research associates: Drs. Rafael Medina and Jessica Budke. The unique ancestor to bryophytes (mosses) arose in the Devonian, and their evolutionary history over the next 400 million years resulted in approximately 13,000 extant species. Although often considered sphinxes of the past, recent evidence highlights episodes of rapid and sometimes recent diversification events, which at least in one case correlates with global climatic change. Furthermore, below the seemingly simple morphology, hides a broad genetic diversity, distinct ploidy levels and likely also subtle physiological adaptations in these typically desiccation tolerant organisms. Intensive populations sampling over the geographical and ecological spectrum of bryophytes often reveals a robust partitioning of the genetic diversity, indicative of cryptic speciation. Bryophytes have not only withstood extinction, they are dynamic evolutionary entities, which thrive in virtually all terrestrial ecosystems. The macroevolutionary history of mosses is characterized by increasing architectural complexity in the mode of dehiscence and mechanisms controlling spore dispersal. However, these innovations are lost in some lineages, resulting in ancestral character-states defining highly derived taxa, often obfuscating their phylogenetic affinities. Whether such reverse evolution is irreversible or results in a dead-end remains unexplored. Reduction in sporophytic architecture may be correlated to features of the calyptra, a hood of maternal tissue covering the developing sporophyte throughout its growth and providing essential protection against desiccation, until the emerging sporophyte has developed its own waxy cuticle that seals its body off against water loss. The architecture of the hood varies among species and we predict that the shortening of the hood is correlated with a shortening and simplification of the sporophyte or compensated by an acceleration of cuticle development on the sporophyte. We seek to test these two hypotheses using the Funariaceae as our model. This family comprises about 150 species representing a broad gradient in architectural complexity of their spore producing generation and their associated hood. The morphological spectrum is defined by Funaria with long stalks subtending the arched capsule, shedding a lid and bearing two rings of teeth and covered by a large hood, and Physcomitrella, with sessile capsules disintegrating at maturity, lacking mechanisms to control spore release and barely covered by a tiny hood. We will reconstruct the transformations of morphological characters based on a phylogenomic history of the family drawn from all three genomes for a total of 210,000 bps, and characterize cuticle development on the calyptrae and sporophyte of species with contrasting combinations of calyptra and sporophyte sizes. DEB-0910258: Doctoral Dissertation Improvement Grant (thesis by Juan Carlos Villarreal): Genetic consequences of the shift to asexuality in bryophytes: insights from the hornwort Megaceros aenigmaticus. The proposed research focuses on the evolutionary history of the asexual hornwort M. aenigmaticus and the consequences of the loss of sexuality on the genetic diversity and structure in the Southern Appalachian (SA) populations. The first part of this study used a multilocus approach to untangle the phylogenetic relationships within the Nothoceros alliance and test the monophyly of M. aenigmaticus. In addition, estimates of the approximate time of origin and the maximum age for the loss of sexuality from a sexually reproducing ancestor within a biogeographical context have been inferred. Data from five loci reveal that the Southern Appalachian SA populations compose a monophyletic lineage that is nested among Neotropical Páramo populations that are also dioicous but sexually reproducing. The clade of SA M. aenigmaticus is estimated to have originated in the Plio-Pleistocene, which is also the maximum age for the loss of sexual reproduction. Haplotype variation based on these four loci is limited, but suggest a differentiation among populations and in particular among males and females. To assess the genotypic diversity within the asexual SA populations and compare it to levels within the sexual Páramo populations a microsatellite library has been developed in 2008. Preliminary screening of one locus shows allelic polymorphism among 16 SA populations. The proposed research for the year 2009-2010 focuses on a complete survey of at least 8 microsatellite loci for around 400 individuals from populations from the SA region and at least 100 individuals from tropical alpine localities in Costa Rica. Predictions based on population genetic theory suggest that SA populations should have a smaller effective population size, lower allelic diversity and high levels of linkage disequilibrium compared to the Páramo. Funds requested from NSF will be used to continue pursue fragment analysis and further increase population sampling size in the SA region and Costa Rica. A last component of the research will be focusing on the molecular signature of the transition to asexuality using nuclear coding regions. Megaceros aenigmaticus, as other bryophytes, have a gametophyte (haploid) dominant with alleles directly exposed to selective pressures. A test of neutrality, recombination and demographic analyses will be conducted. The expectation is that SA populations may have an increase of amino acid changes suggesting little purifying selection, no recombination and reduction in effective population size through time. 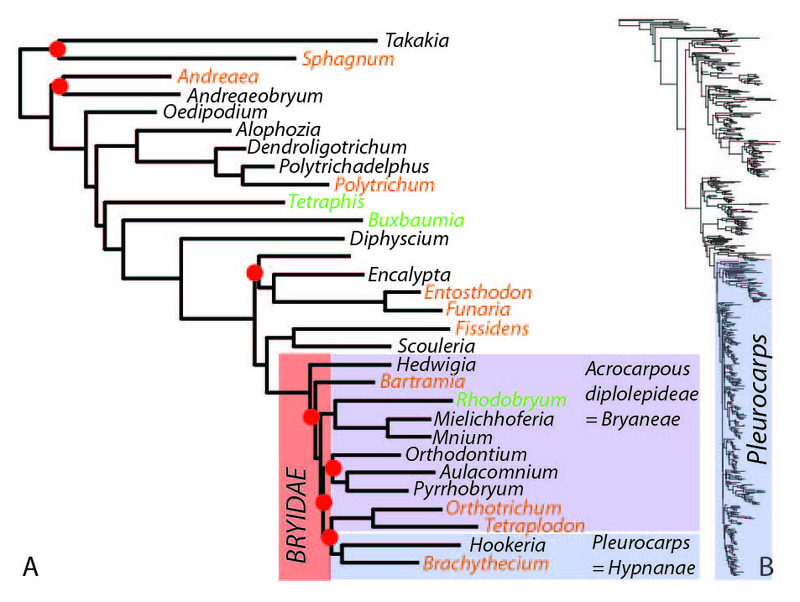 DEB-0089633: Collaborative: Phylogenetic and geographic patterns in moss diversity.